Excellent opportunity in WALKER LAKES just minutes from the BRAND NEW SCHOOL & PARKS! Conveniently located in WALKER LAKE LANDING this unit is an open concept with livingroom, 1 bedroom, a DEN, a 4 piece bath, kitchen with stainless appliances, stacked laundry (full sized), and storage! Access to the covered balcony is located just off of the livingroom. Lots of morning sun and large enough for your table and chairs! This unit comes with one UNDERGROUND PARKING STALL, #197, in the secured lower parkade. IMMEDIATE POSSESSION AVAILABLE. There is NO AGE RESTRICTION and this building ALLOWS PETS WITH BOARD APPROVAL! GREAT VALUE! One of the largest units with the best location. 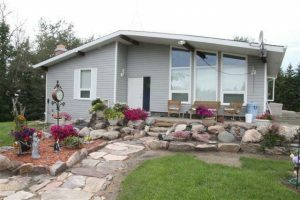 Stunning walkout bungalow in The Shores backing the golf course and overlooking the lake with a gorgeous view! With over 3200 sq. ft. of development & numerous upgrades! Featuring vaulted 9′ ceilings, central air, monitored security, hardwood and limestone flooring, 2 built in Murphy beds and updated ensuite shower to name a few! Rich maple island kitchen with stainless appliances and access to the upper deck. Formal dining, living room with expansive views of the lake plus a stone fireplace! A den is located just off the foyer! Large master with lovely ensuite & WI closet. A bathroom, laundry & access to the garage complete the main floor! A family room, games room, wet bar, additional bedroom with murphy bed and access to the lower patio are all in the spacious & bright walkout. Elegant and luxurious, this home is ready for a new owner to just move in & enjoy! Some furniture may be negotiable. Why rent when you can own your own SUPER STARTER for less! 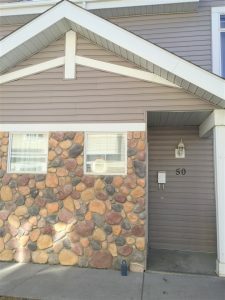 This cute unit features one EXTERIOR STALL with power and a well looked after common area close to all AMENITIES like the ANTHONY HENDAY, SOUTH COMMON & MORE. The GREAT ROOM STYLE floor plan has garden door access to the maintenance free BALCONY, rich HARDWOOD FLOORING and NATURAL SLATE in the kitchen. STAINLESS APPLIANCES and a SLATE BACKSPLASH plus a PANTRY and stainless fixtures finish off this bright open living space. 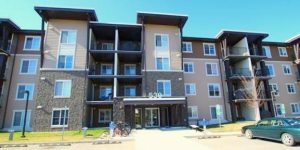 2 BEDROOMS, each with WALK IN CLOSETS, a 4 piece bathroom and a STACKED LAUNDRY area that’s centrally located complete this affordable upper level condo! PETS allowed with BOARD APPROVAL! Excellent opportunity in a fabulous family oriented neighborhood for first time home buyers or smart investors. 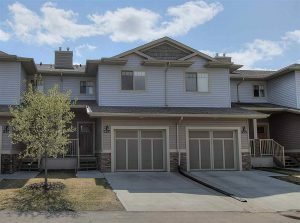 Lower level unit in Suntree Pointe with big bright windows and open concept layout make this one an 11 out of 10! Modern and functional kitchen with pantry and top of the line stainless steel appliances, modern dark cabinets with tile back splash AND room for a table. Cozy and spacious family room. 2 spacious bedrooms, laundry/utility room and 4 piece bath complete the package. Master bedroom features his and her closets. Walk the kids to a brand new school opening in September 2016. Walking trails and parks nearby. Visitor parking and 2 stalls included. Low condo fees include lawn and snow maintenance. Great value for this amazing home! INVESTORS: UPPER UNIT IS ALSO FOR SALE!!! 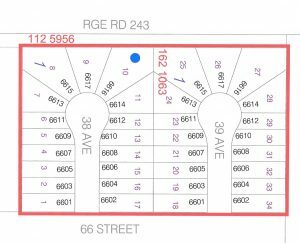 GOLDRIDGE CONSTRUCTION will build you a CUSTOM HOME on this huge pie shaped lot! 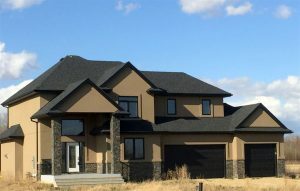 Excellent builder with a great track record, building in and around the Beaumont area. Lots of attention to detail as one of the owners is a MASTER FINISHING CARPENTER. THIS LOT HAS A LARGE POCKET THAT WILL ACCOMMODATE A TRIPLE GARAGE and is for sale or build to suit! Seller also has 4 other lots in the Montrose area that he would sell or build a custom home on! *2016 PROPERTY TAXES HAVE NOT BEEN ASSESSED. BUYER OR BUYERS AGENT MUST CONFIRM AMOUNT WITH THE TOWN OF BEAUMONT. Fabulous location, one of the best in Creekside Ravines! Located in Deer Valley, this unit backs on the ravine and natural area with west views and is right across from visitor parking! Mint condition and professionally painted in decorator colors! ECRU cabinets with granite and stainless appliances, overlooks the living room with corner gas fireplace! Laminate flooring and access to the deck from the generous eating area! A 2 piece bath and access to the attached single garage complete the main floor! 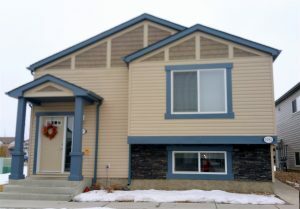 Upstairs to 3 bedrooms, a 4 piece main bath, an ensuite, plus a walk in closet in the master. The convenient laundry is also located on the second floor! Bonus, new flooring in the laundry and main bath as well! The basement is undeveloped and the built in vacuum is located here! A special assessment that has recently been approved will be paid in full by the seller prior to possession. This unit will have a new living room window and the patio doors are also being replaced by their association! Perfect! Exceptional CUSTOM 2 storey home in MONTROSE! 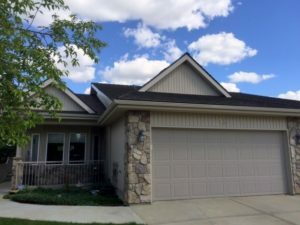 This lovely home features a large foyer, a MAIN FLOOR DEN perfect for a home office or kids play area, A 2 piece bath plus a SUPER LAUNDRY ROOM with plenty of cabinets & CUSTOM STORAGE area lead to the OVERSIZED HEATED GARAGE! The OPEN CONCEPT 18′ GREAT ROOM has Gorgeous TRAY CEILINGS & CLASSIC fixtures, a lovely GAS FIREPLACE & the staircase features MAPLE & IRON RAILINGS leading up to the upper floor BONUS ROOM. Gorgeous kitchen with rich DARK MAPLE CABINETS & central island have tons of NATURAL LIGHT, GRANITE, a pantry with COFFEE ZONE and STAINLESS APPLIANCES. The comfortable nook area leads to a deck & the back yard awash in west sunlight! Up to an extra large master with huge window, BUILT IN SHELVING & WINDOW SEATING. The ENSUITE has double sinks, an OVERSIZED SHOWER & an organized closet! 2 additional bedrooms & a 4 piece bath complete the upper level. The 9′ basement is fully developed with 2 additional BEDROOMS, A FAMILYROOM AND A 4 PIECE BATH. WOW! WELCOME TO COPPER CREEK! Gorgeous BRAND NEW 2 story home located MINUTES FROM BEAUMONT, on the BLACK GOLD SCHOOL SYSTEM, just south of EAGLE ROCK GOLF COURSE. 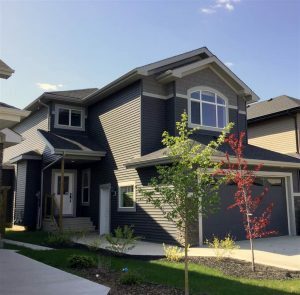 Custom built featuring a large foyer, modern open staircase, main floor den and full bath on the main floor. A STONE WALL with GAS FIREPLACE & TRAY CEILINGS highlight the GREAT ROOM & ISLAND KITCHEN. RICH MAPLE CABINETS, MOSAIC ACCENTS, GRANITE, PORCELAIN TILE, HARDWOOD & A GENEROUS EATING AREA OVERLOOKING the DECK & YARD. MAIN FLOOR LAUNDRY & LOCKER STORAGE FOR THE KIDS located just off the FINISHED OVERSIZED TRIPLE GARAGE. Up to a lovely BONUS ROOM with tons of NATURAL LIGHT 2 additional BEDROOMS. a 4 piece bath and a LARGE MASTER WITH WI CLOSET & ENSUITE with CUSTOM SHOWER & TUB! The basement is undeveloped ready for your finishing touches! A CISTERN provides city water. COPPER CREEK has wonderful HOME OWNERS & the kids are bused to BEAUMONT SCHOOLS! This is the PERFECT PLACE to raise your FAMILY, MINUTES TO AMENITIES, YET IN THE COUNTRY.